After a long day at school, some kids head to their club meeting. Others head to their rehearsal, or go to sports practice. But after a long day of schoolwork, some Woodland students prefer to participate in something a little less typical. They head down to their local firehouse, put on their turnout gear, and practice saving lives. 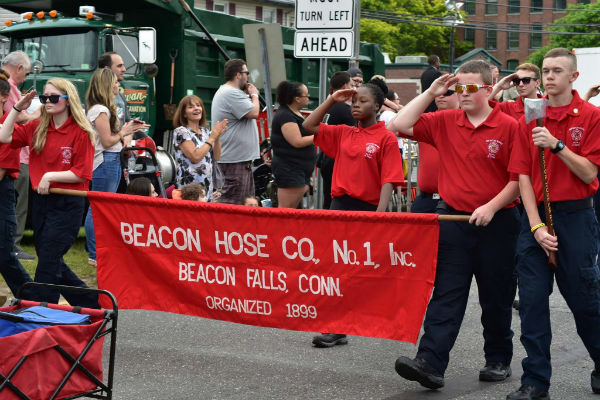 Beacon Hose Co. #1, Beacon Falls’ volunteer fire company, hosts a program called “Junior Corps.”, providing training and guidance for young people interested in the fire and EMS fields. This program is supported by the state of Connecticut, as the state has outlined rules for cadet, junior corps, and explorer programs for fire departments, emergency medical departments, and police departments. There are restrictions on junior members, but for the most part, junior members get to march in parades, train with the department, get certified, take classes at the Connecticut Fire Academy, and even respond to some calls and help in the ways that they are trained to. The program at Beacon Hose is led by Kevin O’Connell, with other members of the department occasionally helping out. Starting out in the program is no small feat; filling out all of the forms, getting a physical exam, getting the correct gear, and attending the first training session you can are processes that can take a bit of time. But members of the department show no sign of being distant, as they are all close, in the sense of being a small family, and a brotherhood. And along with being welcomed at the department, gender barriers are no problem for Beacon Hose. Though fire and EMT may be something that was a predominantly male field, that idea is changing. Lauren Mulinski, a sophomore at Woodland, is one of the only girls in the program. Despite the assumed, age-old idea that girls cannot participate in something of this nature, Mulinski proves this completely wrong. She plans training sessions, helps out with what is needed, and even attends some calls, providing help for her department in any way that she can, stating that she has never worked harder in her life to keep doing something that she loves. Mulinski currently holds the position of First Lieutenant of the Junior Corps, putting her in a leadership position. 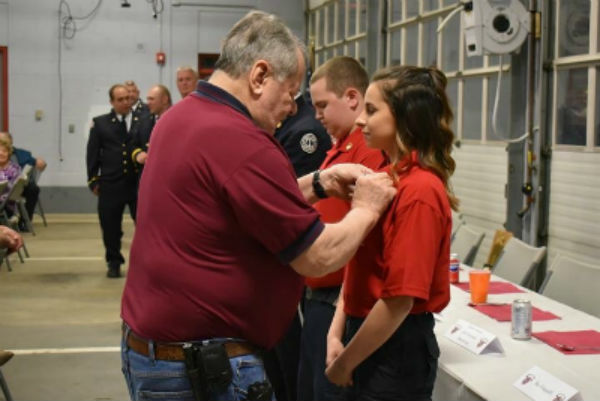 Mulinski is pinned as First Lieutenant of the Junior Corps by her grandfather, a Beacon Hose Co. #1 member for over fifty years, Mitch Mulinski. Photo by Taylor Docimo. Bottom Row: Junior Connor Banks, Sophomore Lauren Mulinski, and Sophomore James Comeau at the 2018 Installation Dinner. Photo by Taylor Docimo. Some members have been in the program since eighth grade, meaning it is possible to join as young as the age of fourteen. 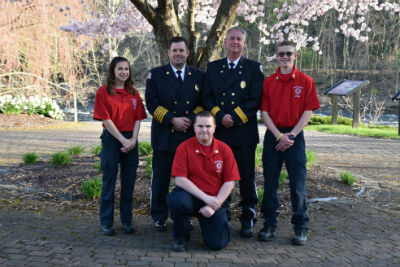 At eighteen, the year of “aging out” out the program, members will make the decision to either become a probationary member and eventually become a volunteer firefighter or EMT, or to opt out and simply finish your time in the junior program. Balancing schoolwork, extracurriculars, and being a junior member is something that’s possible, too. The key to balancing an extracurricular this serious and schoolwork is to stay up to date with your homework, and work hard to always attend trainings to keep yourself up to date with the rest of the group. The world of saving lives is always changing and improving, and staying up to date with the latest technology, equipment, gear, and methods is the key to succeeding in this program. In red from left to right, Lauren Mulinski, Connor Banks, and James Comeau with Brian DeGeorge and Howard Leeper. 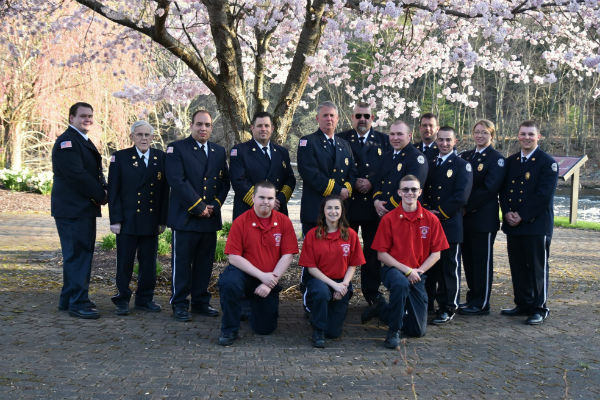 Beacon Hose is one of the many departments to join the wave of helping kids and teenagers grow an interest in the fields of firefighting and becoming an EMT. The teenagers in the junior program get to do something many kids their age don’t normally get to do: be taught life saving techniques, get certified in different skills, and learn a lot more about a possible career that they could hold. Saving lives and helping the community may not always be a glamorous job, but it’s one of the most rewarding jobs out there. The members of the Junior Corps are the next generation of EMTs and firefighters, and they are nothing short of future heroes.